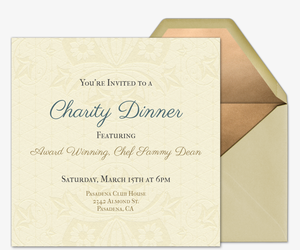 Party for a cause with Charity and Fundraisers invitations from Evite. 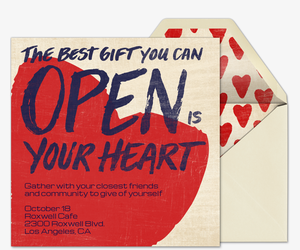 Browse dozens of free and Premium digital invitations to set up for your charitable event. 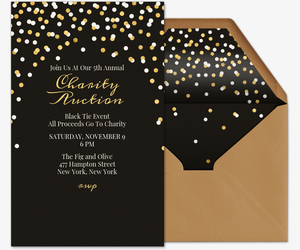 No matter what cause you are supporting -- for nonprofits, hospitals, schools, children, animals, or others -- our gallery has designs to set the tone for both casual fundraisers and black tie events. Check out our breast cancer walk invitations, charity luncheon invitations, silent auction invitations, donor appreciation invitations, and more. With Evite Donations, powered by Pledgeling, it has never been easier to let your events give back to a cause. Evite Donations allows you to add your favorite nonprofit organization to your invitation and let guests donate directly, whether they attend your event or not. Evite never takes a fee from the donations made. 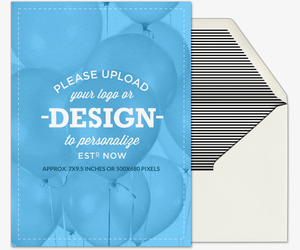 Already have a design on hand for your organization or event? 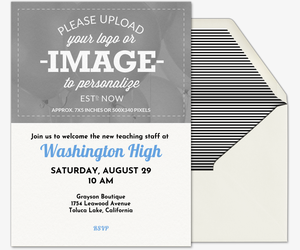 Simply upload it onto one of our Premium Design-Your-Own invitation templates, so you can showcase personal imagery and still use all the functions you love on paperless invitations. 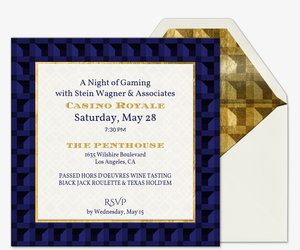 Evite Premium invitations are advertisement-free and come with envelopes, liners, stamps, and insert cards, so they look and feel just like printed invites. Pricing is determined by the number of guests invited. 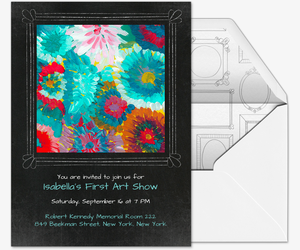 Online invitations will help you manage your event with ease, especially for those larger fundraising functions. Manage your guest list, track RSVPs, send event updates, and collect guest photos all from your event page -- or on the go with our mobile app. Seeking a little publicity? Post your event on social media or via text using your invitation’s shareable link. 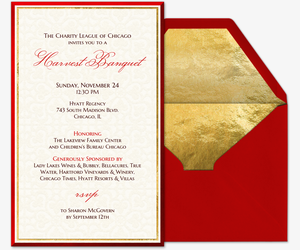 Planning to dedicate a specific event to a charitable cause? You can also browse birthday party invitations, holiday party invitations, wedding invitations, cocktail party invitations, and professional event invitations.